Ok so Virtual Learning platforms are definitely being talked about at the moment. So here are my thoughts. The main contenders have always been Blackboard and Moodle. As s student and educator over the past 7 years I have used and hated both. In recent weeks things have changed. iTunes U has existed since 2007 but on the 19th of January the introduction of iTunes U courses made a difference as Steve Jobs would say ‘this changes everything’. I have been creating courses for over a week and find the experience so incredibly user friendly and can see the benefits. However the gigantic drawback is that unless a college makes their courses public there is limited access. As you can imagine with FETAC guideless etc there are a lot of issues to be discussed before putting any of our own further education courses forward to be downloaded publicly so this is a big brick in the way. For private courses students need access to iOS devices. Sure about half our students do but it is still not ideal. Lectrio is everything that Moodle isn’t (user friendly) and is both mobile and computer friendly unlike iTunes U courses. The platform is currently in beta testing but allows teachers to create a course and upload documents to it. There is also a calendar option which is not available in iTunes U. iTunes U may look a little flashier but other than that Letricio has got it all. 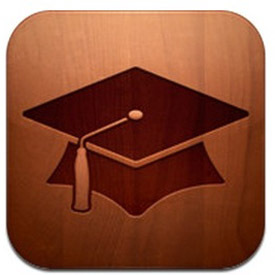 Links items already in the iTunes U store. Can upload videos / images/ documents. The use of private courses is limited to iOS devices. Widely used so it’s got to be good….right? Have only been trying it a couple of hours but so far none. Advantages over iTunes U Courses in access and tons easier than Moodle so I think it is a serious contender it will be interesting to see where they go in the future.